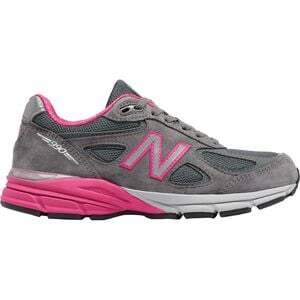 Walk your neighborhood loop with your girlfriends this year with the New Balance Women's 990v4 Specialty Running Shoe on your feet, and you'll finally not be the one turning back early because of aches and pains. Ultralight "fitness" shoes are great for the gym, but not ideal for longer distances and days spent on your feet. The 990 is a classic model from New Balance that added a few modern updates this year without losing the fit and feel so many love about it. Professionals who spend all day on their feet have always loved the 990 for its stable platform and highly supportive construction. The new 990 is no different, but this year, New Balance accented the durable pigskin uppers with more mesh paneling to improve the shoe's breathability. It also added a lace keeper to prevent annoying tongue slippage. Aside from that, the same grippy rubber outsole and rock-solid ENCAP midsole carry over from previous years, providing miles of support for work or play.